Our clients benefit from the ability to access reports and related documentation quickly and efficiently using email notifications and the provided login details we will supply, once your details have been validated. Fast, efficient, accurate reporting available within hours or days, not weeks. An email with a direct link to your report is sent to you when each report is available online. PAT appliances can be found easily within reports using the sort facility. Anywhere, anytime; your electrical reports are accessible via your browser. 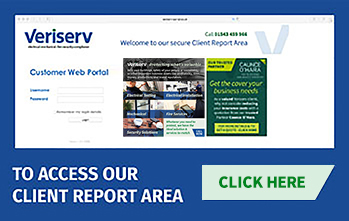 Instant message and feedback with a direct link to Veriserv Customer Services. Multi-site operations allows for contract level, regional level or individual site views via secure password hierarchical system. Invaluable to anyone monitoring or supervising an electrical maintenance contract with the ability to utilise the web reporting site and job views as a management tool for due dates. See at a glance whether your report contains failed appliances. Ease of retrieval. Load your own PDF documents and our electronic invoices to the system keeping all associated documents in once place. For more details regarding our online reporting, report management and system, see the Electrical Testing & Compliance page and click the Reporting & certificates section in the side navigation.